Dr. Milan Milovancev, soft-tissue veterinary surgeon at the OSU Veterinary Teaching Hospital, uses cutting-edge technology to remove the cancerous lobe of a dog’s lung. The well-thumbed magazines and stacks of newspapers in the sunny lobby of the Small Animal Hospital at OSU represent many hours of patient waiting for the thousands of pet owners who visit the Lois Bates Acheson Veterinary Teaching Hospital each year. Referred by their family veterinarian, most of the hospital’s clients bring pets with complex health issues like cancer, compound fractures, heart conditions, or rare diseases. With the largest group of board-certified veterinary specialists in Oregon, and state-of-the-art facilities, OSU can bring together diverse resources and a team effort to heal these challenging conditions. A recent example of complex teamwork kicked into gear in January when a twelve-year-old Weimaraner visited the hospital with a swollen toe. Alijah was an outwardly healthy, active dog but his family veterinarian was concerned about a small growth on the second toe of his right foot. She referred his owners to OSU for further evaluation. Dr. Stuart Helfand is a veterinary oncologist with thirty years of experience in cancer care for companion animals. When the x-rays he ordered for Alijah revealed a suspicious area in his lung, Dr. Helfand was able to consult with Dr. Sarah Nemanic, a veterinary radiologist at OSU. They advised Alijah’s owners that a Computed Tomography (CT) scan would help determine the nature of this suspicious mass. The OSU Veterinary Teaching Hospital (VTH) has a 64-slice CT scanner that is currently the fastest, and only one of its kind, used in veterinary medicine in the United States. This high-speed and precise machine is capable of capturing detailed, 3-dimensional images of the entire body of small animals, providing diagnostic information that cannot be obtained using other imaging techniques. Alijah’s CT scan revealed a two-centimeter, irregular lesion on his left lung. Based on the shape of the lesion, Drs. Helfand and Nemanic decided it was likely to be a lung tumor. The CT also revealed a ten-centimeter mass in the dog’s spleen. Dr. Nemanic then did an ultrasound-guided biopsy of the lung lesion which was tested in the OSU Veterinary Diagnostic Laboratory and found to be cancerous. As with many cases at the VTH, doctors offered Alijah’s owners several options for treatment, from continued monitoring to surgery. His owners elected to have Alijah’s spleen, second toe, and right lung surgically removed. This option was possible because a dog doesn’t need his spleen, the second toe is not a major weight- bearing toe, and the loss of one lobe of the lung does not create a major impairment. 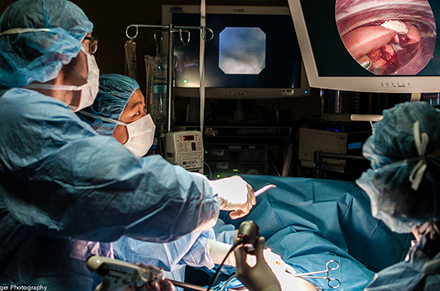 Alijah’s left lung was removed in a video-assisted thoracoscopic surgery where a small video camera is inserted into the patient’s chest via a 5mm scope. Dr. Milan Milovancev, a veterinary soft-tissue surgeon, was then able to operate through small incisions to remove the lung without opening the chest cavity. This allowed the dog a faster recovery and reduced his chances of infection. Alijah recovered well from his surgery. At his two-month checkup, all incisions were healed nicely, and tests revealed the masses on his spleen and toe were benign. His lung tumor was confirmed as carcinoma, and with any cancer there is some risk of recurrance, but Alijah’s tumor was small and removed with good margins, and his lymph nodes were not involved, so his prognosis is good. In addition to the four lead specialists on the team who worked on Alijah’s case, several resident doctors in medicine, surgery, oncology, anesthesia, and diagnostic imaging also lent their insight and expertise to his case. In addition, the team included certified veterinary technicians who focus on specialty areas of medicine. This multi-specialty interaction among several doctors working in concert to deliver the highest level of patient care is what makes the OSU Veterinary Teaching Hospital a unique resource for advanced care of animals.